This bangle says you mean business. That is all I can say. Look at it! 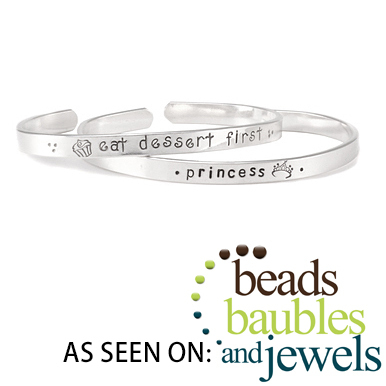 It's the bangle of all bangles. 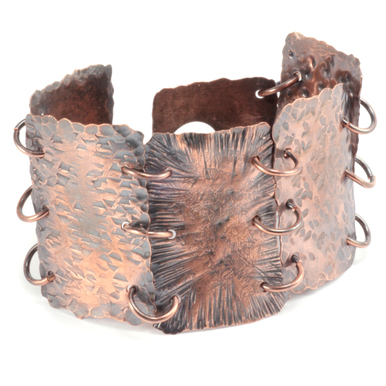 Show off your riveting style AND your Riveting Skills with this awesome piece. 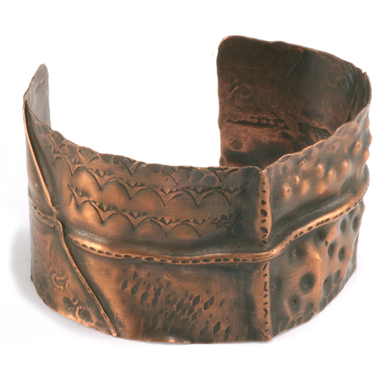 Measure the circumference of your hand; yep, your hand... since this bracelet is riveted closed, you want to make sure it clears your hand to be able to wear it on your wrist. Take that measurement and cut the length of the sheet with your shears. File the corners with a metal file until they are rounded and soft to the touch. Make your word tab using 24 gauge copper sheet; cut, file, stamp. Rivet the word tab to the flat textured sheet. We used copper nail head rivets, 1.5mm hole punch plier, flush cutter and riveting hammer. Shape the bangle using a nylon bracelet bending plier. This doesn't need to be perfect, you just need the two ends to overlap so you can rivet them together. Punch the holes, put the rivets into the holes with the nail heads on the inside and place the bangle onto a steel bracelet mandrel on top of a sand bag. Rivet. Now round the bangle by lightly hammering it with a dead blow hammer, plastic or rawhide.